I just finished my second Lanie Toner for the Kansas Doll Show over Labor Day Weekend. I have also completed Luciano and Roux Brace to take along. I am currently painting Tasha Schenk (she will be unrooted for a hair painting class by LaDonna Briggs Brooks). Working on Shyann Peterson (alternate limbs by Denise Pratt) and she should hit the rooting table in the next day or so. Love River Morgan - did you root lashes? Applied lashes? Or painted lashes? Oh I love little Tink Andama I did a couple .. sounds like your pretty busy like me I have heads painted for someone else... I was one of the crazy ones that paid a crazy price for photo bucket !! 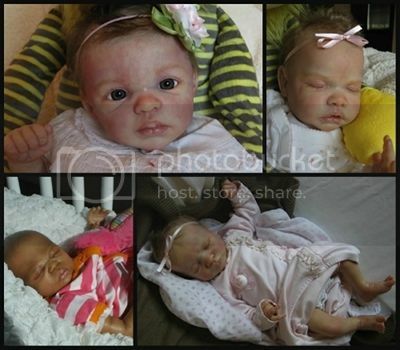 Gosh Pia you have a lot on the go, some nice Cassie Brace Sculpts.. lovely to work on Cassies babies. I was next to Cassie last doll show I did shes a lovely lady.